I’m super excited, my adorable niece is about to have her first baby. So that means my brother will be a grandpa, (what?!) and that will make me a Great Aunt (cool – I’ve always considered myself a pretty great aunt!). So for her baby shower, we got our sewing machines and fabric out and had so much fun with a few sewing projects for baby. There’s nothing like handmade baby gifts to make us all swoon! I can’t wait to try a few of these other great ideas! 1. To begin with, have you seen these amazing knotted hats? You can dress your baby in style with these cuties! 2. Oh, I always loved my car seat canopies. Find easy directions on this sewing project for baby here. 3. How to make a tag blanket. I sure wish I would have had these 13 years ago when I started having my babies! 4. Aren’t these diaper clutches the best things ever? Perfect for church or a quick outing when you don’t want to lug an entire diaper bag around! 5. Whip up a nursing cover for the nursing mom and they’ll love you forever! 6. Use up your scraps with these fabric beach balls! So soft and cuddly for the kids to play with! 7. Aren’t these knit receiving blankets just super adorable? 8. There’s nothing better than a pacifier clip to keep those pacifiers off the floor! 9. Is your baby a drooler? Then, these baby bandanna bibs are oh so cute and practical! 10. Are these mary jane shoes not the cutest things you’ve ever seen? 11. Because what new mama wouldn’t love some extra burp cloths? 12. This minky blanket looks so soft and easy to sew! I’m thinking I should make an adult size one too while I’m at it! 13. Here’s a free pattern for a knotted baby head tie…also there’s a video attached that gives lots of great instructions! So darling! 14. Here are some great burp cloths that are super absorbent and cute! This is what my cute sister-in-law just made for her first grand baby. They turned out so great! 15. Did you ever wake the kids while checking on them? I hated that! This latch cover is a great solution and is one of my favorite baby sewing projects to give as a gift! 16. Also, some great directions on how to make your very own changing pad cover! 17. 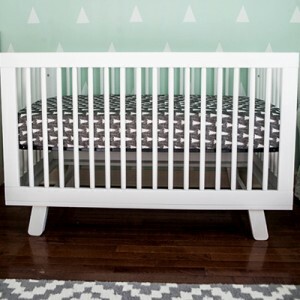 It seems like crib sheets are something you can always use plenty of and I couldn’t believe how easy this really was! 18. Check out this great tutorial for how to make the perfect corners every time in your sewing projects for baby! 19. Make some personalized DIY car seat toys, no baby will resist these! 20. These tiny harem pants are just so cute! 21. And of course, we can’t forget our amazing quiet books. These have been designed by our fabulous Chickabug exclusively for HowDoesShe. Do you have your patterns yet? Do You Have a Favorite Sewing Project for Baby? If we have missed a great sewing project that you love to make, then let us know in the comments! I hope you cuddle those little ones for me! My baby is 3 now and not so cuddly anymore! I love the whole idea about making things for my baby to come and would love to try one of your idea for my baby. I am having trouble printing the knotted hat template. Do you have a secret?